Queenstown • Drive through Mt. Cook National Park. • Enjoy a Gondola Ride to Bob’s Peak. Whitianga • Visit the Kiwi 360. • Enjoy a Gold Mine tour. • Visit Hot Water Beach. Auckland • Panaromic City Tour.Any increase in the Airfare / Airline Taxes / Visa fees fuel supplement charged by the airlines(Calculated at 1st July 2016 rates). Porterage, tips, insurance, laundry, wines, mineral water, telephone charges, suggested excursions and all items of personal nature and also What your Tour Price does not include food and drinks not forming part of the group menus. Tips of NZD 2 per person per day to be paid compulsory. Upon arrival into Christchurch, our local driver will be waiting outside the custom area to welcome you and take you to the hotel. The rest of the evening is free for leisure. Overnight at your hotel in Christchurch. Today, we check out and proceed to Queesntown. En-route we take you on a panoramic tour of Christchurch. Drive past the city’s parks and gardens. See the Gothicstyle University building. Later we continue our journey to Queenstown. We pass through Mt. Cook National Park and stop for a photo opportunity at The church of Good Shepherd and Lake Tekapo. The beautiful Church of the Good Shepherd, where the altar window frames a perfect view of the Southern Alps beyond the lake. The church is located only metres from the teal blue waters of the lake and provides spectacular views that are remembered by visitors for the rest of their lives. On arrival into Queenstown we check-in to your hotel. Overnight at your hotel in Queenstown. Today, we take you on a tour of Queenstown. Visit Arrowtown where you can leisurely browse through the shops for a wide range of New Zealand made merchandise. Later, enjoy a gondola ride to Bob’s Peak for a stunning view of Queenstown. Marvel at the stunning views as you ride the Skyline Queenstown Gondola - the steepest cable car lift in the Southern Hemisphere. Sit back and relax as the best views in the region unfold before your eyes and the Gondola carries you 450 metres above Queenstown and Lake Wakatipu to the top of Bob’s Peak. Rest of the evening is free to enjoy the activities of Queenstown on your own. Overnight at your hotel in Queenstown. 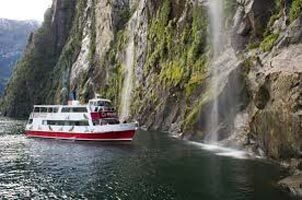 Today, we take you on for a Full day excursion to Milford Sound. We proceed through the lush beech forests of Eglington Valley. Here we board our enchanting cruise (weather permitting) and enjoy the fjordland scenery. Situated on the west coast of the South Island, Milford Sound is a fusion of spectacular natural features with amazing visual cues around every corner. Milford Sound was carved by glaciers during the ice ages. It is breathtaking in any weather. The fiord’s cliffs rise vertically from the dark waters, mountain peaks scrape the sky and waterfalls cascade downwards, some as high as 1000 metres. Later, we drive back to Queenstown. Overnight at your hotel in Queenstown. Today, we check out of the hotel and drive to the airport to take our flight to Auckland. On arrival into Auckland we drive to Rotorua. Enroute we visit Waitomo caves. Take a boat ride on the underground river and visit the Glowworm Grotto. As your boat glides through the darkness, thousands of tiny glowworms light up the cave to give you an unforgettable experience. Later we continue our journey to Rotorua and check-in to your hotel. Overnight at your hotel in Rotorua. Today we take you on a tour of Rotorua. We visit the Agrodome and Sheep Shearing Show. The World Famous Agrodome is a must see for any visitor to Rotorua and New Zealand. Home to the multi award winning Agrodome show - an exciting and informative insight into the world of New Zealand agriculture, featuring 19 breeds of sheep. We later visit Te Puia Thermal Reserve, world famous for the ‘healing waters’ of its thermal spas. It’s fascinating to see the range of thermal activity going on in the valley and quite a sensory experience. Steam creeps out of fine cracks in the rocks everywhere, and it winds around stubby little manuka shrubs perched perilously on ledges. Later we get a chance to experience Maori Culture at the Te Puia Village with Maori houses and cultural experiences. Overnight at your hotel in Rotorua. Today, we check out and drive to Whitianga. Enroute we stop at Te Puke and visit Kiwi 360 where we celebrate the incredible NZ Kiwifruit and the rich culture which surrounds it. We climb aboard a KiwiKart and tour through our lush orchards. Relax and rejuvenate in the Kiwi360 Cafe or shop to your heart's content in our Kiwi360 Shop. And don't forget to bring your camera, for a photo in the famous giant Kiwifruit. Later we visit the Waihi Gold Mine tour Waihi is a gold town, and we have a fascinating and unique gold story to tell You'll be fitted out with safety gear as you board our 11 seater van, given a safety briefing then taken inside the security fence to view the mine operations from the best available vantage points. You'll be shown every stage of the process from ore extraction and crushing, through to final processing. There is plenty of massive mining equipment on show too. Next we visit Hahei beach and Cathedral Cove. Located on the Coromandel Peninsula, Hahei beach is an attractive beach fringed with pohutukawa trees and drifts of pink shells at the northern end. The offshore islands provide something of a breakwater, making this sheltered beach ideal for swimming, boating and fishing. We then take a water taxi to Cathedral Cove. Accessible only on foot or by boat, famous Cathedral Cove is one of the “must visit” sites on the Coromandel Peninsula. Cathedral Cove Marine Reserve, covers 9 square kilometres and is New Zealand's sixth marine reserve. Just around the corner is Hot Water beach. Naturally heated mineral water bubbles up from deep within the earth to emerge through golden sand at the appropriately named Hot Water Beach. Dig your own hot pool metres from the Pacific Ocean at world-famous Hot Water Beach Later we check into your hotel Overnight at your hotel in Whitianga. Today we visit the Driving Creek Railway. Take an unforgettable train journey of Driving Creek Railway .The innovatively designed trains takes you through replanted native kauri forest and includes 2 spirals, 3 short tunnels, 5 reversing points and several large viaducts as it climbs up to the mountain-top terminus. Overnight at your hotel in Whitianga. Today, we check out and proceed to Auckland. On arrival we take you on a panoramic city tour of Auckland. See the Harbour Bridge, Auckland domain, Queen street and City centre. Later we check-in to your hotel. Overnight at your hotel in Auckland. Any increase in the Airfare / Airline Taxes / Visa fees fuel supplement charged by the airlines(Calculated at 1st July 2016 rates).